The quality of our lives is largely influenced by the events or experiences we’ve had and the lessons we’ve learned along the way. The older we get, the more experiences we will have, which should also equate to more life wisdom. Well, that’s what it should be. I’ve met many people who should be wiser as a result of their life experiences, but they keep repeating the same types of behaviours and keep getting the same types of results. Making the same mistakes when they get into new relationships. Not being responsible with their finances. Putting their careers ahead of their health or personal relationships. Pushing themselves too far with their work. Our time on Earth is limited and even though we’re all on different journeys in life, there are certain things we should never learn late in life. The good thing is we can always learn lessons in life not just from our own experiences, but also from other people’s experiences too. Many years ago, after I had completed my university studies, I started planning where I wanted my corporate career to go. I was given many opportunities to further develop my skills, which in turn, would benefit the company I was working for at that time. There was one major problem — I wasn’t enjoying the work I was doing. A valuable lesson I learned early in my career was there is no point climbing up the ladder of success only to find that your ladder is leaning against the wrong wall. I went on a quest to find what the “right” wall is for me, which has led me to the work I am doing now — being a writer, trainer, coach and speaker. I’m grateful I learnt that lesson early which gave me the motivation to do work that was aligned to who I am and what I am meant to do in this lifetime. 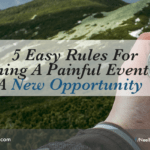 Here are five important lessons we can learn now instead of learning them later in life, which can prevent us from experiencing any unnecessary anguish or pain. The sooner we can integrate these lessons into our lives, the better off we’ll be. Life is very short. There have been many interviews conducted with people close to death and most of them wished they had “lived” more. They all say their life went by so quickly. Some regret not doing things that really mattered to them instead of doing things that were expected of them. One of our missions in life is to find what really matters to us and do that the best we can. Worrying about things will not solve anything. 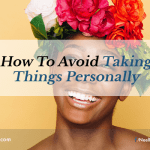 We’ve all been there — something bothers us and we keep worrying about it. Worry has often been defined as negative goal setting. We are more likely to bring in more of the thing we are worrying about because that’s what we are giving our attention to. Instead of worrying about what we don’t want, our focus should always be on the solution — what we want. Do not trade your life for material things or success. We never really own anything in life because at the time of our death, what we think we own will belong to someone else. We are programmed to believe that material success or fame is what we should pursue because they equate to happiness. The reality is living our passions and purpose in life is what will bring us the true happiness we are seeking. The only thing that matters is the present moment. Living in the past or living in the future is not where life happens. Life only happens in the present moment — in the “now.” We cannot change what has happened in the past. We can only learn from the past. We cannot predict what will happen in the future. We can only do our best to create a better future by making intelligent decisions now. Do not live from your fears, instead live from your heart. Our fears has a voice and so does our heart. All too often, we listen to the voice of our fears instead of the voice of our heart. We should never let our fears dictate the decisions we make and how we live our lives. Our fears tend to keep us safe and inside our comfort zone, whereas our heart is always guiding us to pursue what really matters to us, which often will require us to be courageous and step outside our comfort zone. If life is a series of lessons, then it’s up to us to learn the lessons that will enrich our lives. The last thing we want is to be on our deathbed wishing we had done more with the life we were given. It’s not too late to learn these lessons now and use them to have a better quality life. Action Step: Choose the lesson that resonates most with you and make a decision to integrate that lesson fully into your life. 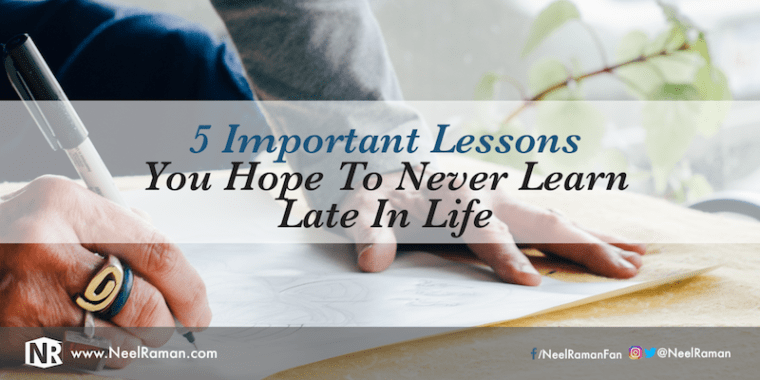 Question: What is another important lesson we hope to never learn late in life?